There is something to be said for seeing friends that have moved away and started new a new life. Recently that just happened and it made for a grand evening. Social Media is a wonderful way to keep in touch, and I had noticed that a good friend of ours was back in Michigan from Florida for a relative’s wedding. I had mentioned to my Bride about it, and opined that once somebody is up for an event like that, that there time is not their own, because they are under the timelines of the event that they are attending. Was I surprised to get a message, asking if the three of us could get together for dinner and drinks and some reminiscing. We thought back to all of the times before of dinners either here or in the Orlando area when we were there last, and all of the dinner or wines that I wrote about were with her company. She is a very gifted and creative artist, and when my Bride and I got married, this friend supplied all the floral arrangements as her gift to us; what a generous offer that was and still is appreciated to this day. We met at a restaurant that we have gone to several times recently, because it was near where our friend was staying. We met at Nico & Valle in Plymouth, which I have written about a couple of times and had some excellent meals. We also enjoyed a bottle of wine Ornella Molon “Bianchi Selezione” Sauvignon IGT 2012 from Veneto, which I have also, wrote about. There were two things that I want to mention that caught my interest that evening besides our charming guest and the delightful evening. The first was a brochure that our friend dug out of her purse to give to me, that she was very excited about. She was doing some floral arrangements and some of the interior decorating for a new company at their first two locations, with more locations to follow. The company is called Vine Vault and they had locations in Atlanta, Georgia and Austin, Texas with another one soon to be in Miami, Florida. Vine Vault is a wine storage facility for people to store their wines in a climate controlled system with a biometric security system. They offer concierge services for the storage, handling, inventory, insurance, receipt and shipping without having to do it yourself, with signature lockers. They also have tasting rooms, assistance in finding wines as well as winemaker dinners. It is a virtual turnkey operation for the wine collector, especially if they live in a condo or an apartment, without the space for a wine cellar on the premises. Our friend was all agog about this new company. The other thing that caught my eye, that I did not notice the last time we had the wine, because we only ordered it by the glass, was the cork that the wine had been sealed with. 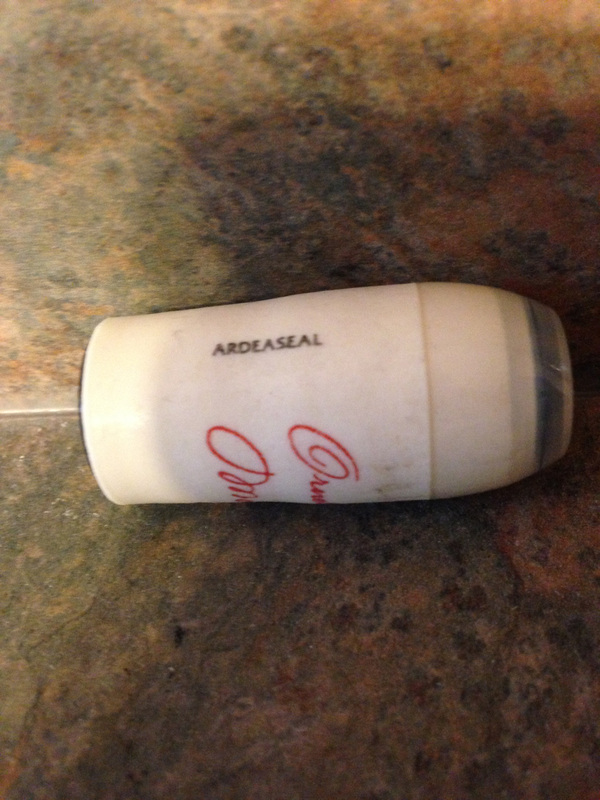 I have experience synthetic corks before; this wine was sealed with an Ardea Seal, which was very unique and totally new to my eye. Ardea Seal has been created by Coro Developpment Srl of Italy and uses three different components to guarantee chemical inertia of the wine. The company uses computerized production to craft the seal and offers total customization for their clients. They first started off in Burgundy, which they consider their main market, but are now found in Italy, Spain, Australia and Japan; the seals can be used for wine, brewers, spirits and olive oil. So besides have a wonderful unplanned evening out, I discovered some innovations about services for wines and a chance for us to enjoy the company of an old and dear friend. This entry was posted in Dining, Uncategorized, Wine and tagged Italy, Ornella Molon, Sauvignon Blanc, Veneto. Bookmark the permalink.